I loved everything about Luvi the first time I set foot in the cozy, Technicolor space at the corner of Tchoupitoulas and Bellecastle streets. I love the way the loud wallpaper that looks like undulating snow-capped mountains rendered in Batik contrasts with the screamingly bright floral patterns on the sleek slipper chairs and the small wooden dresser that has been repurposed into a wait station. None of these things should be in the same space but, like a shimmery fairy dust, the energy, passion and pure thrift that brought these disparate elements together renders them perfect, the only acceptable backdrop for chef Hao Gong’s exotic, playful Asian hybrid cuisine that draws on elements of his Shanghai upbringing, stints at restaurants around the U.S. and his decade-long career as the head sushi chef at Sake Cafe. Some dishes, such as spicy Szechuan Dan Dan noodles and Mala Holla (razor thin slices of beef shank in ghost chili oil) hearken to Asian traditions. Others, like the Monkey Snack (raw salmon, sesame-crusted banana and a spicy-sweet sauce) are his own mischievous creations. It is apropos that Gong named this bright culinary play spot for his young children, Lulu and Violet. His core belief that we feast first with our eyes is evidenced on the plate in bright pops of color, patterns and layers. The dim sum-sized Snow White from the raw bar brilliantly combines cubes of creamy whitefish ceviche with fried garlic, paper thin slices of cucumber, Rice Krispies and brightened with the tang of yuzu sauce. He does his mama proud with the dumpling soup he named for her complete with elegant origami-like pillows filled with pork, ginger and cabbage floating in a complex soy broth. For $45 there’s the Feed Me. You get elements that capture the chef’s attention and inspire him at any given moment. Though I have yet to experience it, I’m definitely looking forward to the trip. 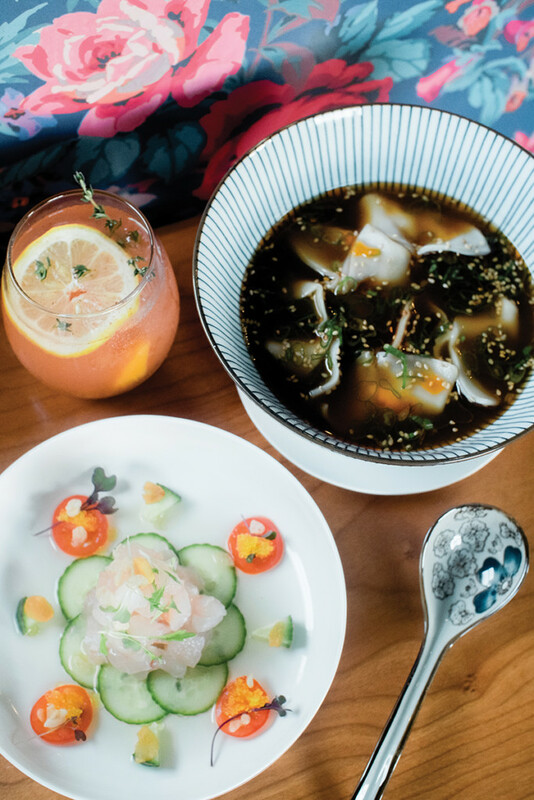 In addition to an atmosphere, an attitude and a menu that lands Luvi solidly on the list of “My Extreme Happy Places,” there’s the inventive and daring wine and cocktail list that blasts it off the charts. David Goldberg is the man behind the bar and he comes packing close to a decade of restaurant, bartending and brewery knowledge, most recently at Tin Roof Brewery in Baton Rouge. The Blue Uzumaki, Afternoon Kanpai and Senseition are simply brilliant, and I was blown away by the presence of Gruner Veltliner (a light, bright Austrian wine I keep at home) by the glass. Austrian wine on an Asian menu? This takes stones. On a very different day, I recently treated a delighted, grateful friend to breakfast at Willa Jean. Though an appetizer starter with breakfast may seem ridiculous, allow me to insist that you definitely go there. The Artichoke Dip starter arrives in a crock, hot, gooey and topped with loads of browned and chewy “cheese business” and a pile of toasted shards of crostini upon which to slather said artichoke and cheese business. It set the stage for a beautiful day. The American Sector Restaurant & Bar at The National WWII Museum recently completed an eight-month renovation and rolled out a new Victory Garden-to-Table menu that furthers the focus on contemporary American cuisine with throwback touches. A weekend brunch has also been added.